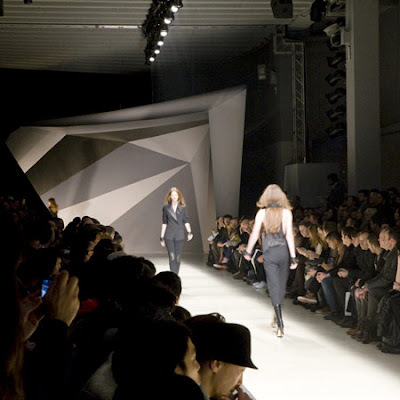 Designed by AquiliAlberg based in Milan, Italy they designed a runway show for designer Neil Barretts Autumn-Winter 2010 collection on Sunday, January 17th in Milan. 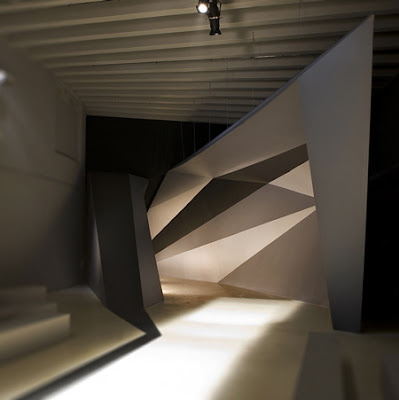 The tunnel of the catwalk, where the models walked out was formed to create a backdrop for the runway. It was Barretts first time collaborating with Aquili Alberg. 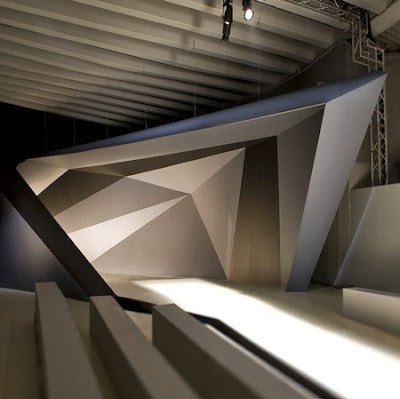 The designer chose two of AquiliAlberg’s sculptural installations as a background for his latest fashion show. shown that highlights the designer's specific style by cutting garments up and splicing them together in new ways, horizontally, vertically and from back to front to create hybrids. Set against the sculptural backdrop designed by AquiliAlberg, the collection is also a nod to the myriad ways that architecture influences dress. AquiliAlberg studio’s designs are open to different interpretations. A series of sliced surfaces generate a complex, yet controlled volume, obtained through three-dimensional digitalisation. The configuration gives the sculpture character, and wraparound lines create multi-faceted volume. Individual perception of the space, which has a kaleidoscope feel, differs according to physical position. This search for spatial complexity has its roots in Optical Art. Neil Barrett has always been fascinated and inspired by architecture, interiors and the crossover between these areas and fashion. In 2008 he opened his Concept Flagship Store in Tokyo, Japan, using architectural curves and layers. I personally am studying paper folding and architecture and this piece is a perfect example of the form and duality of paper folding in architecture. The shapes and edges are right on, and the look is a perfect hit for me. I love these type of shapes in architecture and get so excited that we are able to create architecture like this. 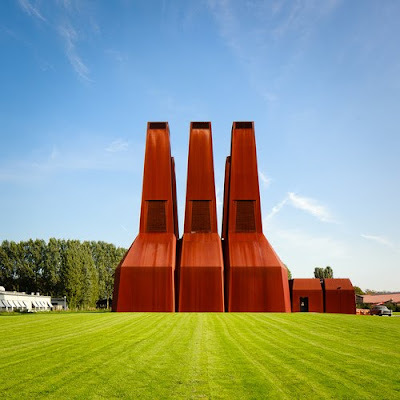 I think personally that not only are this form of architecture visually pleasing but also have so much behind the theory and thought of the design. Paper folding its self is an amazing art and to use it in architecture just blows me away.The idea of using fashion as an inspiration for this piece is also fun. There are so many inspirations out there in this world for architecture and to relate the two for a fashion use is fun and exciting.